Multiple people have been injured at a vigil for the late rapper Nipsey Hussle, police have confirmed. 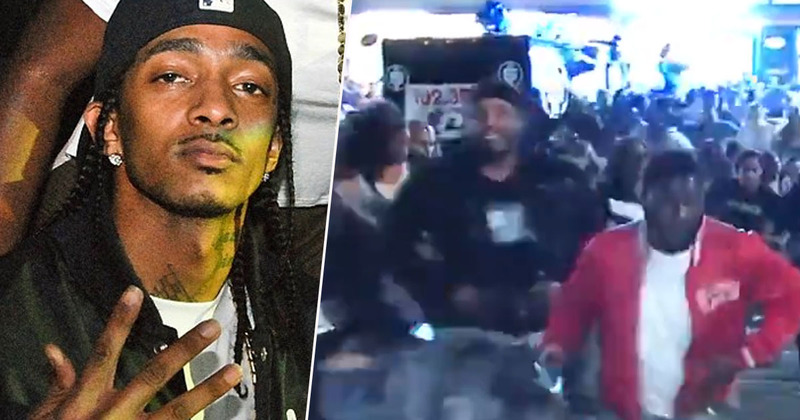 Nipsey Hussle – real name Ermias Davidson Asghedom – was shot dead on Sunday (March 31), outside his clothing store in Los Angeles – a shooting which wounded two other people. Tributes immediately began pouring in for Asghedom who, as well as being hugely respected in the music industry, was a community organiser, being involved with the Destination Crenshaw arts project. But now, a vigil in the rapper’s memory has turned violent, with a number of people being injured as they attempted to flee the scene. Between 300 and 400 people were outside the place where Asghedom was shot, The Marathon Clothing store, last night (April 1), to pay tribute to him when a fight erupted in the crowd, Associated Press reports. Fire Department spokesperson Margaret Stewart initially said firefighters received a report of a possible shooting or stabbing at the vigil. However, LAPD have since said reports of shots fired ‘do not appear to be accurate’. As people in the crowd attempted to run away, authorities say many people were trampled and a total of 19 people have since been taken to hospital – two of which are in critical condition. Of those in a critical condition, one person was struck by a car in the chaos while the other suffered a ‘penetrating injury’, Stewart confirmed, although it’s not known whether this person was stabbed or cut by broken glass. Two other injuries were serious and 15 were considered non-life threatening. Shortly after the vigil, police identified a suspect in the murder of 33-year-old Asghedom, who was pronounced dead on arrival at an LA hospital. According to an LAPD tweet, police are now investigating Eric Holder, 29, for the murder. The shooting is said to be gang related. Tragically, it’s since been confirmed Asghedom had planned to meet with LAPD’s police chief and commissioner on Monday afternoon to discuss a plan to prevent gang violence.